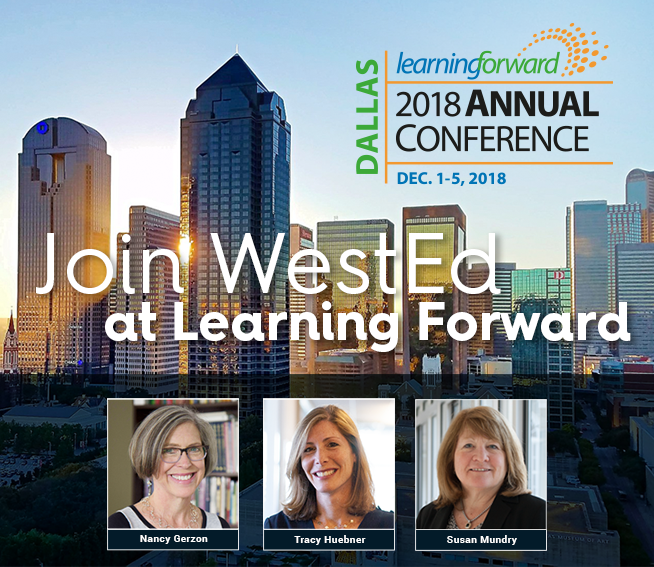 WestEd will be present at the Learning Forward 2018 Annual Conference, held on December 1 through December 5, 2018, at the Gaylord Texan Resort and Convention Center, in Dallas, Texas. With this year’s theme, “All Learners, Many Perspectives, One Community,” Learning Forward puts educator learning at the forefront. The conference brings colleagues, inspiring practitioners, and thought leaders together to help tackle some of the most pressing teaching and learning challenges in education today. Add WestEd sessions to your calendar. Meet some of our expert staff and clients, and learn about our Teacher Practice Networks, an initiative that supports nearly 800 teacher leaders across urban schools in New York City, Los Angeles, Birmingham, and Boston. Learning Forward Sponsor Reception: Monday, December 3, 4:30-5:30pm at the Gaylord Texan Resort & Convention Center, Grapevine Ballroom C & D. WestEd invites attendees to visit the WestEd table #14 and meet with other K–12 leaders and our expert staff. Information on WestEd professional services and resources will be available.